Tom Quirk sends me thought provoking news. Since 1920, ice cores from Law Dome show only one significant pause in an otherwise relentless rise in CO2. Ominously, that sole plateau occurs from 1940 to 1950. If human activity drives changes in global CO2, there is no mistaking that the pause was during the only decade that war went global. The question has to be asked: Is war an alternative to wind-farms? Who would have thought all the tanks, bullets and bombs, and all the men in green uniforms, could be so good for the planet? World War II must have been a low electricity use time. In World War 2, direct action against the evil large fossil fuel polluters took on a new meaning. Don’t just tax those factories, bomb them! Ahem… (all jokes aside – let’s look at that data…). Then knowing that the Antarctic record will smooth out spikes into flat plateaus, Quirk shows that there is a plateau in the Law Dome records of CO2 levels that starts at the same time as WWII. He estimates that CO2 levels must have spiked up and then down to produce the flat line. Curiously the spike down rather fits with sea surface temperatures in the Southern Hemisphere (it must be a coincidence ). Pace Murry Salby. Just imagine we were taxing, trading and burying CO2 in holes in the ground (not to mention building masses of windmills and solar panels) but at the same time we didn’t know the major sinks and sources of CO2 emissions? Welcome to the post modern economy — where money is wasted on billion dollar scales every day. Near constant values for atmospheric CO2 in the 1940s have been found in ice core measurements made by the CSIRO at the Law Dome in Antarctica. Ice core measurements come from bubbles trapped in the ice which, while forming, sample the atmosphere over a period of years. Fortunately there is a way of measuring the time window over which the ice core bubbles sample the atmosphere and this has been done by the CSIRO. A peak occurred in atmospheric CO2 labeled with radioactive carbon-14 in 1963, before the Partial Nuclear Test Ban Treaty came into force. There was a near doubling of carbon-14 CO2 and this peak was captured in the ice cores at the Law Dome. Comparison with direct air measurements in New Zealand enables the calculation of the extent of atmospheric sampling in the ice cores. The sampling is approximately characterized by a normal (Gaussian) distribution with a 4.2 year standard deviation (Figure 1). Figure 1: Direct atmospheric measurements in New Zealand and ice core measurement of C-14 labelled atmospheric CO2. The continuous green diamonds area modelled ice core simulation from redistributing the direct measurements using a normal distribution with a standard deviation of 4.2 years. The reverse process of unfolding the ice core CO2 measurements is now possible. The result shows that the apparent plateau in the 1940s for CO2 is the result of a fall in atmospheric CO2 concentrations at the South Pole in the middle of the 1940s. It is not possible to simulate the measurements using a plateau in atmospheric CO2 concentrations (Figure 2). Figure 2: Law Dome ice core and direct South Pole measurements of atmospheric CO2. Solid line – modelled direct atmospheric CO2 concentrations increasing at 0.389 ppm per year before 1946 and 0.556 ppm per year after 1948. The continuous red line is the simulated ice core measurements assuming a 4.2 year standard deviation for atmospheric mixing in the ice core air bubbles. The analysis shows there was a 3 ppm fall in the 1940s for atmospheric CO2 removing some 6 Gt of carbon from the atmosphere. Estimated CO2 fossil fuel emissions for two years at that time might add a further 1 ppm or 2 Gt of carbon to be removed from the atmosphere. This fall may well be the result of a sudden fall in Southern Hemisphere sea surface temperatures in the middle of the 1940s. So by using a direct atmospheric marker, carbon-14, to understand the ice core response as it captures CO2, it is possible to unfold the ice core measurements to get the direct atmospheric CO2 concentrations. The results suggest that the behaviour of the sinks of atmospheric CO2 remains poorly understood. I trust those who fought in World War II will forgive us our use of the free speech they helped protect. The war was substantially a Northern Hemisphere event. Methinks human activity, even during total war and the industrial activity to support it, is insignificant in terms of climate, compared to natural variations. The SST records don’t falsify that conclusion. The Southern Hemisphere appears to be stronger in determining global climate because of the area of water which acts both as an effective absorber and emitter of heat. “Superficial” ocean circulations drive climate cycles on a decadal scale. Makes sense and the data is somewhat sympathetic if its tortured enough. When the 60-year ocean cycle is extracted separately for NH and SH ocean temperatures, there does seem to be a 4 year lag between peaks/troughs in SH and the NH. There is variance in the SH that doesn’t show up in the NH or the global average, although I can overlook that if there were far less measurement sites in the SH than NH. Whether the remainder (the dark blue line) after subtracting the oceanic cycle is caused by the sunspots or CO2 is left as a reader exercise. That little blue downtick at the start is quite tantalising, eh. I wonder if the smear becomes wider with time. There is a phenomenon known as frost heaving, in which thawing and freezing causes substantial displacement of material. This can occur in very cold regions, in permafrost. Normally it is soil material – rocks, pebbles, soil – which is displaced by frost heaving, but I wonder if gas bubbles could be similarly displaced? Surely what matters is whether the foreign body has a different density and physical properties to the ice, not whether it is solid. Given that even polar regions sometimes thaw a little, we’re always told how glaciers are full of fissures and cracks, and pressurised regions of liquid water, it would not surprise me if over thousands of years, displacement of material causes all the ice layers to become smeared to the point of uselessness. Think about those huge convoys during the War. Most of them coal burners. 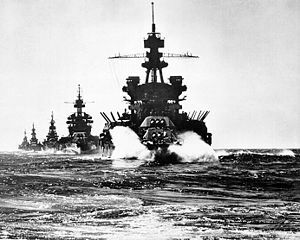 The main image shows USS Pennsylvania, a fuel oil burner, as were most of the major capital ships in the U.S. Fleet, but even those emitted copious CO2, and most older Naval vessels and transports on all sides were all coal burners. With the huge increase in shipping operations, both Naval and support during the war, and the huge increase in air operations, you would think emissions for the Second World War would have spiked, if anything. Apart from all the other matériel made by both sides, there were 2,710 Liberty ships built in the US between 1941 and 1945. That figure alone is astonishing. But let us not discount the impact of the almost total blackout of lighting, on all sides, during the war. Lighting typically is a very small component of my monthly electricity bill. I don’t think blackouts can affect totals much. Although a few select examples survived, coal fuel for marine propulsion became a minority during the 1920′s. Merchants started switching to oil pre-WWI, mostly completing the change by 1930, as oil could be stored in the double bottoms freeing accessable bunker space for cargo. As merchant oil fuel use drove worldwide availability, navies followed suit. Almost nothing significant was built with coal fuel after 1920, most older vessels were converted, and by WWII, coal fueled vessels were a rarity. One Guy Stewart Callendar an English steam engineer, was an amateur meteorologist. In 1938 he published his theory based on examination of temperature measurements going back into the 19th century and comparing them with measurements of CO2 in the atmosphere over the same period. Callendar saw a definite correlation between the two sets of data. Certainly he was ahead of many scientists in recognising that the Earth had warmed. He spent a good deal of WW2 in charge of lifting the fog off airport runways, in particular those of Bomber Command in East Anglia. This involved burning thousands of tonnes of oil at a time. The figures show how little man’s best efforts contribute to change. 1940-1950 was also a cooling period after the mid 1930′s peak (now erased by GISS et al). This cooling could explain the drop in CO2 as the balance with ocean CO2 was reversed. I can’t agree with Mr Quirk or yourself that the SH ocean was the single cause of such an anomalous drop in CO2 in 1945. Firstly on the HadSST3 12-month average the SH drop is -0.25 in two years (1944-46) and the NH drop was almost as large, so the SH doesn’t look special. There is also no sign of other SH temperature changes in the HadSST3 data causing such CO2 pauses/spikes. In 1965/66 the NH increased by much more than SH, whereas in 1968/69 the SH increased much more than NH, but the CO2 response is virtually the same in both cases. In 1983/84 the SH increased by much more than NH, but the CO2 response is quite muted compared with neighbouring years. The real test is the years when SH and NH went in opposite directions. In 1994/95 the SH went down the NH went up and still the CO2 had a positive increase. In 1964 and 1974 there were large drops in SH temperature but quite different CO2 responses. Looks like neither hemisphere’s ocean has a stronger influence on CO2 than the other. That’s just by eyeball, so any discrepancy is not obvious. Mr Quirk didn’t use HadSST3 and I don’t know if it is more or less accurate than the NCDC series. Wouldn’t tonnes of it been consumed throughout the war. The burning of gunpowder does not take place as a single reaction, however, and the byproducts are not easily predicted. One study’s results showed that it produced (in order of descending quantities) 55.91% solid products: potassium carbonate, potassium sulfate, potassium sulfide, sulfur, potassium nitrate, potassium thiocyanate, carbon, ammonium carbonate and 42.98% gaseous products: carbon dioxide, nitrogen, carbon monoxide, hydrogen sulfide, hydrogen, methane, 1.11% water. And now with current usage, does discharging a fire arm count as a CO2 emissions source, and how much Carbon Tax would have been raised over World War 2? I have to agree Dave, one reference I found has Dupont producing 4.5 billion pounds of explosive for the military use. Dupont I believe was the largest US manufacturer of gunpowders and explosives but I imagine there were many others around the world at the time. Possibly, but the naval (and army) guns used ‘gun cotton’ – nitrocellulose as the propellant. Resulting in lots of CO2 and nitrogen oxides; both potent greenhouse gases. Explosive used for bombs was based on oil and ammonium nitrate. There were other nitrated explosives in use hence TNT (trinitrotoluene) being used as a ‘standard’ for explosive power. Smokeless powder has been used for decades, starting back as far as 1880. I find this quite remarkable considering the relatively tame nature of the comments. Let us not forget that Labor’s candidate for the same seat, choo-choo McTiernan, Godwinned herself at the old town hall a few years later when comparing CAGW skeptics to the WWII German regime. Just realised there was a WWII theme … so I was on topic! A controversial $200 million wind farm that divided a local community and drew opposition from a nearby maximum security jail has secured planning approval to proceed. Infigen Energy’s 33 turbine wind farm planned for Bodangora, near Dubbo in central NSW, was approved by the state’s Planning Assessment Commission late last week with the ruling only made public on Monday. In a potential setback to opposition at other proposed wind farm sites, the commission dismissed community concerns that noise from the turbines would affect their health. Plans for future wind farms in Britain could be in jeopardy after a United Nations legal tribunal ruled that the UK Government acted illegally by denying the public decision-making powers over their approval and the “necessary information” over their benefits or adverse effects. Obviously, then, to save the planet we need World War III as soon as possible. A Sagan fantasy – see Crichton, M. – Aliens caused global warming speech. O/T: Junkscience.com drew my attention to a recent paper in the journal Science & Education dealing with the 97%. P.S. Also posted back in the Tol analysis. The work of Ernst-Georg Beck always seems to be forgotten. I first discovered via Ian Plimer’s book ‘Heaven and Earth’ that atmospheric CO2 levels had been assayed well before the Mauna Loa era using so-called ‘wet’ chemical analytical methods. Plimer points out that the methods have never been compared with each other. That’s quite an oversight by the climatologists I would say. I wanted to know more, and contacted the Carbon Dioxide Information Analysis Center (CDIAC) in the USA. I was surprised to say the least to find out that they knew nothing about the old methods! I later obtained a copy of Beck’s review of thousands of chemical method analyses. Essentially, he came to the conclusion that present day CO2 levels are not unprecedented, and that values around 400ppm have occurred before. I’m going to speculate wildly here. Wouldn’t it be interesting if CO2 levels start to drop in the next few years – have we in fact reached a peak? I’ve made a couple of edits to the post– just in case the spirit of those first few paragraphs was not clear. File this in the “Semi-Satirical Times”. Indeed! I’ve always wondered about the sheer effort of war that was sustained on Russian soil 1941-1945;with millions of men and masses of machinery- not to mention the Caucasus oil fields in flames.My father survived it as he was wounded in 1943,but it always amazed him in the magnitude of the engagement-not to mention it’s tragedy.I would not be surprised that a global cooling might result from this. So thats why Obama wants to invade Syria. To lower his carbon emissions. No, he wants to join forces with Al Qaeda in supporting the Rebels. Both sides have now been shown to have access to Sarin. Which side pulled the trigger? This is taking, “the scientific evidence tells us”, meme to a whole new level. And the Australian Government backs the Americans. They lied about the Gulf of Tonkin. They lied to us about Iraq*. And yet the Aust. Gov. tags on yet again when they peddle their “intelligence” about Syria. Suzlon ceded its position as the top wind-turbine supplier in India for the first time in at least a decade last year as it struggled to repay debt accumulated from acquisitions. The company and its units had about $1.5 billion of debt denominated in the greenback and owe the equivalent of about 66 billion rupees in euros, data compiled by Bloomberg show. another astounding discovery – fake FactCheck’s r fashionable, it seems & Greg Hunt shows just how surely the CAGW scam will continue! 3 Sept: The Conversation: FactCheck: is protecting global rainforests the best way to rapidly tackle climate change? Election FactCheck contacted Hunt’s media spokesperson, requesting a source for the statement that “nothing would do more to rapidly decrease the risk of climate change than a major plan to protect global rainforests”, and to clarify if the timeframe for that rapid decrease was between now and 2020. “I imagine you may not have read Tim Flannery’s works on rainforest protection, the UNFCCC reports on the REDD or the Norwegian Government analysis of their investment in rainforest. Bill Laurance receives funding from the Australian Research Council and other scientific and philanthropic organisations. In addition to being Distinguished Research Professor and Australian Laureate at James Cook University, he holds the Prince Bernhard Chair in International Nature Conservation. This chair is co-sponsored by Utrecht University, Netherlands and WWF-Netherlands. Alan Pears AM is a part time educator and researcher at RMIT. He also provides advice to organisations in the sustainable energy and climate response sectors. His investments include ethical superannuation funds and a community wind energy organisation. 3) – Thinks the WWF is a scientific organisation. Someone please remind me again how everything is going to get all better as soon as we get a change of government. the warmists NEED the tropical forests, so they can get them chopped down and replaced by oil palms to make biofuel. IMHO preserving the forests would do more good than any palm oil plantation, and certainly be better than biofuel for a number of reasons. Depends on how much we change the government. Jeez people, vote for minor parties and independents. Put the LNP 3rd last whenever you can. Independent or Uniting Australia Party. Here is a preferred*¹ order for the Senate. an Independent or a Uniting Australia Party candidate1. an Independent or a Uniting Australia Party candidate2. Wikileaks or Secular Party*² candidate1. Wikileaks or Secular Party*² candidate2. [11...74] anybody else in any order. *¹- Disclaimer: This is not a “How to vote” card, the information presented is of a general nature and does not take into account your personal, electoral, and financial circumstances, please use the AEC to check who’s on your ballot before polling day. Replicas of the Titanic on sale until 22 Sept or until sold out, limit 1 per customer. I may switch at the last minute. *³- just to make the Greens really mad, . Just Google to go through paywall if necessary. Anyone who puts Palmer up near the top pretty much failed the IQ test like those who put the Greens up there. He may know how to run successful real estate deals or shaft the Chinese trying to make their project work in WA, but I sincereely doubt he has the first foggiest clue what to do for the economy. I am not saying the other mainstream candidates are much better, but they don’t have the feral nature of Palmer (I know this from people who have had to deal with him professionally). Palmer = angry Kevvie on horse steroids. Which reminds me, we have seen Mrs Abbott and Mrs Rudd but when do we get to see Mrs Palmer? and what about all his daughters? Thumbs hands up for that one Crakar24. In case you guys missed it Palmer jumped the shark this morning on Channel Nine Breakfast TV with Karl as the interviewer. He even accused Murdoch’s ex-wife Wendy of being a Chinese spy, I kid you not … just Google Palmer Chinese spy Murdoch, I am sure it is viral by now. Is there a way that we can get, on all channels, in an infinite loop, Topher’s Interview with Donna Laframboise onto the in-flight entertainment system of one of Greg Hunt’s longer flights? just found the time to watch/listen to your 50:1 interview. what a joy! topher was terrific too. hope we can get the 50:1 website link up on as many websites/platforms as possible. I know it’s a bit gruesome and in no way am I making light of this but how much GHG’s are released during decomposition, let alone being burnt? methane etc.. The numbers are still shocking. you forgot to allow for “carbon offsets” Yonniestone. Stalin killed off more than those listed by you, both BEFORE, and again AFTER WWII. Mao Zedung killed off more than both your list and Stalin combined, post WWII. A collection of minor genocidists, from Pol Pot to any number of Latin American Dictators, pulled their weight. Truth is, those killed in WWII really only amount to “background noise” in our ongoing predilection for, and ability to, annihilate each other in large numbers. Ditto for the above posts on the CO2 contribution of all the bombs in WWII. Fact is, NATO dropped a higher tonnage of bombs on Libya to maintain a “no fly zone” (no, don’t ask me to explain – sanctioned mass-murder is not my strong suit), than the total of all the explosives that were used in Europe by all sides combined in WWII. you actually touched on an important point of this AGW fiasco, the warmists like to throw only cherry picked scientific basic arguments at the public, 97% of all scientists, CO2 has more forcing etc.. to a point where any reference to AGW will evoke these statements as a factual answer where the truth is often more than just one element. So where 6 million murders looks (and is) shocking the other deaths in that century alone (as you pointed out) are often overlooked by Joe public, as is the rest of the science and facts to debunk AGW. Do you have a reference for those bomb tonnages, MV ? Straight out of MSM news reporting at the time of the Libyan massacre civil war, Mike. Repeated in news items here, the USA and UK, so probably suspect. On the other hand, these days we regularly drop/fire/launch single bombs with a higher total explosive content than a complete squadron of Lancasters during WWII, so who knows. Gotta be skeptical about that MV. The firestorms in Japan (pre atom) used a lot of explosives. Meanwhile I am reminded that war involves a lot of just waiting. The action may be spectacular but the periods of nothing can be quite long. Yonniestone (post no. 18): you seem to have to have no empathy with those who perished or appreciate that there are those alive today who either were involved in the conflict or lost loved ones. A thoughtless and insensitive posting. Carbon500 I’m sorry you took it that way, what part of “in no way am I making light of this” isn’t clear? It was and still is a genuine scientific question, if you want to try and moderate questions/comments of this type then we might have a problem discussing deaths via fuel poverty in England or Africa due to green agendas, just because someone may get offended on the internet, may I recommend you never comment on Youtube. I noticed Jo used dark humor at the start of her thread, any complaints?, and for WIW I have served my country as did a few of my Uncles and great Uncles and a Grandfather some of which made the ultimate sacrifice, so yes I do have empathy for the fallen in WW2. I may be insensitive at times but never thoughtless, good day. Yonniestone: I take the points you make in posting 18.2.1. Your reference to the decomposing and burning of WWII victims is of course a point of brutal historical fact, which I think some people could become upset by. I know for example that my mother was scarred for life by her experiences, and there were things I never asked about as I didn’t want to stir her memories. That said, I accept in the light of your comments that my criticism of your stance was somewhat harsh. Thousands of people in one of Africa’s poorest countries are going hungry because of a biofuels “land grab” by a firm that receives funding from the Department for International Development, a charity claims. ActionAid accuses the Swiss company Addax Bioenergy of threatening livelihoods in rural communities in Sierra Leone, where it runs an extensive sugar-cane plantation. Some EU officials say they are hopeful there will be convincing progress towards a global market-based mechanism. “I’m optimistic, but it’s difficult and we need political will from the United States, China and India,” one EU official said on condition of anonymity. So now these snivelling bureaucratic officials hide behind anonymity? Did the anonymous person request anonymity for the words about ‘optimism’ or ‘the need for political will’ or that ‘it’s difficult’ or all of it? To me, this still suggests that ice core bubbles are an unreliable record of ancient atmospheric CO2 concentrations. I guess I’m an ice core skeptic. Hi I have just a thought, if you’ve ever heard of Geo-engineering you may know about the possibility of using iron to fertilize the Ocean so that the little algae plants grow on mass and soak up the extra Carbon Dioxide. Well during the WW2 wasn’t there allot of ships sunk? Guess what they were made of, ya you guessed it iron. Look’s like we may of had a test run. Look’s like it worked. Hopefully the next time someone try’s to do that again the greenies will let them do it this time. I say again as their has been attempts to do this but you guessed it Greenpeace and other green groups stopped them. Maybe this will shut them up next time someone wastes their time and try’s to fertilize the Oceans again. Ya I know Greenpeace and the like shut up, and pigs fly too. I know my bad. Well the history’s facts and science fit the idea that all that sunken iron could of had that effect on Co2 levels but your guess is as good as my guess. The iron was intended to be added in soluble form to the surface water. There was a trial that showed that it might work in improving the growth of algae. Personally I think that any geo-engineer is dangerous and never to be encouraged nor permitted to run amok. Too often they have a simplistic view e.g. a “sure fired cure” for global warming, and are blind to any possible side effects. There’s a vast difference between powdered iron and iron (steel, in many cases) plate. Iron plate can last for a century or more underwater, especially when covered with marine life and dimensionally stable corrosion products. Wrought iron is even more resistant to corrosion. See “H. L. Hunley” for more information on a Confederate sub recently raised from the ocean floor. 1945 … what happened in 1945? Two nuclear weapons. Nuclear energy prevents CO2! Note Tom’s chart shows a constant rise to 1945(the end of the war) THEN a fall until about 1947, before the climb recommences, surpassing the 1945 level again in about 1953. A temporary industrial lull in the aftermath of war, perhaps? The smoothing effect is interesting – perhaps puts earlier ice core peaks in a different light. That con?sensus of Cook etc not 97% but 0.3%. A major error in Cook’s maths, geeezzzzz do ya reckon? What an embarrassment this twit is to poor OZ. BTW a wonderful assessment of Krudd by the Fairfax chairman. I couldn’t have said it better myself. The next day, after eating some more dung, he reached the second branch.. The farmer arrives for one of these two on Saturday, when will the next one go? Paywalled – Google as usual. Doesn’t seem to work for me Bulldust. What am I doing wrong? Google the title of the story and click the obvious search result … google always pierces the Australian (and SMH) paywall. i’m not a fan of frakcing, but this is peculiar coming from the EU Energy Commissioner! “LDK’s missed payment will enable the process of weeding out the companies that have become uncompetitive in an industry that is mired with oversupply,” said Amit Jain, a Bangalore-based analyst at SJS Markets Ltd. “The industry will run its course and only the fittest will survive.”. Mr Turnbull says all Australians will be better off if they have very fast broadband, but he says under Labor, that will not happen any time soon. Mr Turnbull says the report does not address the arguments for fibre to the premises or fibre to the node. Deloitte Access Economics also used scenarios provided by the Department of Broadband, Communications and the Digital Economy to weigh up how high-speed broadband would impact on different types of households. It found a single person aged over 75 could be up to $7,000 better off each year because improved access to online health services may reduce the number of doctor visits needed and keep them out of an aged care home. ***The authors also say their report is not a cost-benefit analysis of high-speed broadband, and “does not include analysis of the capital or operational costs of broadband networks”. Yes, tradesmen will come so much faster through the NBN. They will be able to work from home, saving all that travel (and reduce CO2 emissions too). No need to go to Doctor or Dentist or even Hospital as you will be treated via the NBN. Politicians won’t have to go to Parliament house, they can address you directly through the NBN. Only the authors of this report (and Albanese for spruiking it) will have to travel the old fashioned way to the looney bin. UNIVERSITY of Queensland scientists have been accused of fabricating research that was published in a prestigious European scientific journal. UQ referred the claims to the Crime and Misconduct Commission in July and asked for the study to be retracted pending the outcome. The researchers received a $20,000 grant from a “non-government organisation” to conduct the work, which UQ had decided to return pending the outcome of the investigation. A former UQ staff member from the Centre for Neurogenic Communication Disorders Research was corresponding author on the paper. He who better understood climate change economics 50 years ago than virtually every professional today. And had an intellect such that he never needed to resort to scientific modelling. Still at 140 feet. Nope. No sea level rise there. And that is El Dedo del destino. The Fickle Finger of Fate! There is another point which has puzzled me viz. that the estimated global CO2 emissions from fossil fuel burning were relatively insignificant prior to 1945. Yes, but will the information appear on the TV News outlets? A hundred years from now, the “linking” of “CO2″ and “climate” will be recorded as the greatest step backward since a Western civlisation based on rational thought began. This “concept” has thus far generated more damage and waste than all wars combined. And people complain of Roman Catholic Church stifling of science! They were AMATEURS compared with the Green movement. The Galileo Movement’s new video about the 2013 election http://www.youtube.com/watch?v=sEJyHFdQ_vs very interesting. Cluey Voter makes it easy to vote “below the line” to really make your vote count. I had a look and found them especially helpful for what preferences are given to other parties. Also a good way to get Australians to do homework on who they might vote for, one can live in hope. I do hope this one gets filed under the heading, TRIVIA. Let us hope it doesn’t mean that a war is better for the environment than peace. Interesting though, as trivia goes anyway. There must be something to it. The same central banking crowd pushing the climate change bandwagon, are the ones trying to create a new world war. They must think war is the cure for climate change right? Or maybe they just think we are all stupid. Reflecting the rampant growth of weeds in smashed cities?